This comes up quite a bit on the forum, so I figured I’d make a guide to explain how these hero attributes work, what they do and how to use them best to your advantage. How do I find the Attributes? First, I’ll cover how to find hero attributes in War Flow. The improve tab will allow you to view the attributes of heroes that you’re currently using and their attribute upgrades. You can also improve your attributes from this tab (see Improving Attributes below). Click the “Heroes” button on the bottom of the WarFlow screen (near the clock). You’ll see the listing of heroes on the left, Click the Hero you’d like to see attributes for. Base attributes and improvements are listed near the bottom of this pop up window. Current attributes (including improvements) are listed near the top of this pop up. These are the basic descriptions of each of the attributes. You’ll find detailed information about each of the attributes in the following section. Strength affects the efficiency of Normal Attack and Normal Defense. Dexterity affects the efficiency of Skill Attacks and Skill Defense. Intelligence affects the efficiency of Strategy Attacks and Strategy Defense. You may not be clear on the difference between the terms Normal, Skill and Strategy, yet. Here is how they are used and what they actually affect. Normal Attacks (also called “Common Attack”) are your basic attack. Your hero will attack one or more of your opponents (depending on the hero) and will deliver a certain amount of damage. Weapon – Equipping and upgrading a weapon has a direct impact on the Normal Attack for a single hero. Arming Tech – Upgrading this tech affects the Normal Attack for all of your heroes. Troop Count – More troops inflict more damage with Normal Attack. Increasing your hero level and all equipments (especially tokens) increase Troop Count. As troops are dying in battle, Normal Attack will decrease. Normal Defense controls how much damage you’ll receive from your opponents Normal Attacks. Armor – Equipping and upgrading Armor has a direct impact on the damage that a single hero will receive from a Normal Attack. Armoring Tech – Upgrading this tech affects the Normal Defense for all of your heroes. 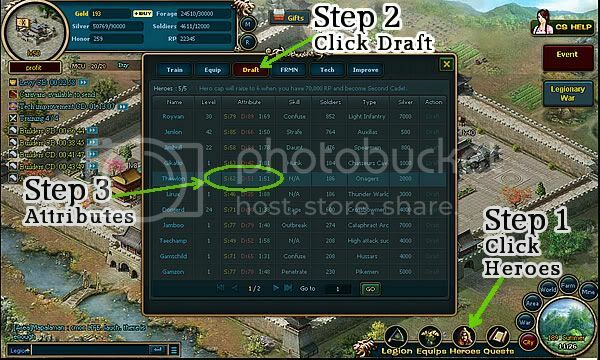 BU2-FRMN – The BU2 Formation increases the Normal Defense for all heroes. Skill Attacks are special attacks that are based on Morale. Skill attacks can be offensive or defensive. They can attack multiple units, cause extra damage, or have other effects on your opponent or they can increase defense or abilities of your own armies. Skill Attacks will not be used until your unit’s Morale reaches at least 100. Skill defense reduces the effectiveness of opponents offensive skill attacks. Strategy Attacks replace Normal Attacks and Skill Attacks. There are 4 types of heroes that use strategy attacks – Warlocks, Healers, Dance Troupe and War Drummers. These heroes have no other attack. Warlocks – Warlocks’ Strategy Attacks are offensive attacks. They cast a variety of different attacks that will cause damage and/or possibly cause other effects on opponents (lower morale, secondary damage, disorder…). Healers – Healers use a defensive “Attack” on your own armies. It has a chance to revive some of your lost troops. Healers do not attack your enemies. Dance Troupe – Dance Troupes also use their attack on your armies. Their attack has a chance of increasing the target’s morale to 100. This is most effective when the target has a strong Skill attack. War Drummers – War Drummers attack your opponents army, but cause no damage. They effectively “steal” morale (at a set rate) from your opponents and give it to your own armies. This can protect your armies from opponents’ skill attacks and increase the opportunity to use Skill Attacks, but unlike Dancers, will not charge morale all the way to 100(initiating a skill attack). Books – Books directly increase the damage or likely-hood of a Strategy Attack for the hero to which it is equipped. Engineering Tech – Increase effectiveness or chance of successful Strategy Attacks for all heroes. TU-FRMN – Upgrading and using the TU formation will increase the effectiveness of Strategy Attacks for all heroes. Troop Count – Increasing your Troop Count by training your hero or equipping items will increase the damage of Strategy Attacks & the amount of healing. Strategy attacks will decrease as troops are killed in battle. Strategy Defense will either decrease the damage received or the chance of a successful attack against your heroes. This has no effect against drummers (which succeed 100% of the time), nor against your own healing or defensive attacks cast by your own heroes. Head Dress – Directly increase the Strategy Defense for a single hero. Scouting Tech – Directly increase the Strategy Defense of all heroes. Formation – As of level 50, I have not seen a Formation that increases Strategy Defense, I will update later if I find one. Using improvement methods on a hero is one way to tailor them to their attack style and increase their effectiveness. Advanced 2 Gold – You start the game with the ability to upgrade a hero with 2 gold. The first 2 times that you use this, your hero will receive +5 to all attributes. I suggest you use this twice on every hero to reach +10 on all attributes. Platinum 20 Gold – Once you hit VIP level 3, you open this option. I haven’t had great luck with the 20 gold option. It seems to work a lot like the 200 honor option. I suppose early on if you had plenty of gold and limited honor, you could use this in place of the honor option. Premium – At VIP 6, you open a premium gold option. I haven’t reached this stage yet, so I don’t know if it is more effective than the Platinum/common option. This section will be updated as questions are asked and answered. Post any questions in this thread and they will be added here. Training does increase your troop count and therefore Normal and Strategy attack damage & healing. It also allows you to equip a better equipment. What about Troop Count for Skill Attacks? After extensive testing, I could not find a direct noticeable correlation to troop count and Skill Attack effectiveness. 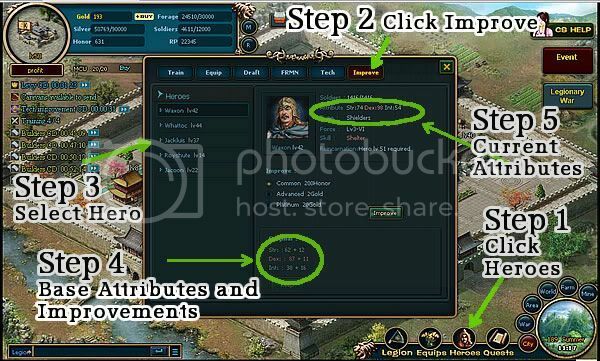 Platinum 20 Gold – As Gold Player u can use this Option after Advanced 2 Gold. Your hero will receive +5 to all attributes. I did this till all Attributes were +60. But it workes only till the Heroes Level is around 25% higher. 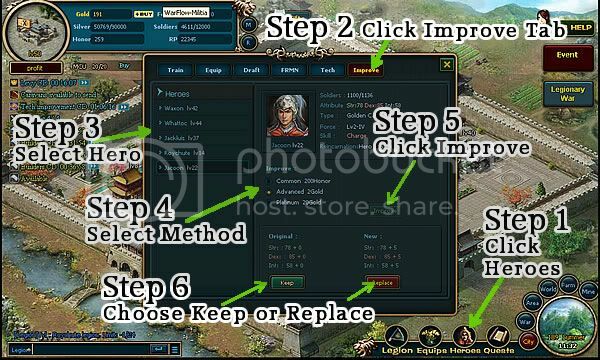 Premium Optin is simular, but u can upgrade all Attributes +5 till u rech Hero Level. After reching Hero Level using Gold seems to be like using honor.